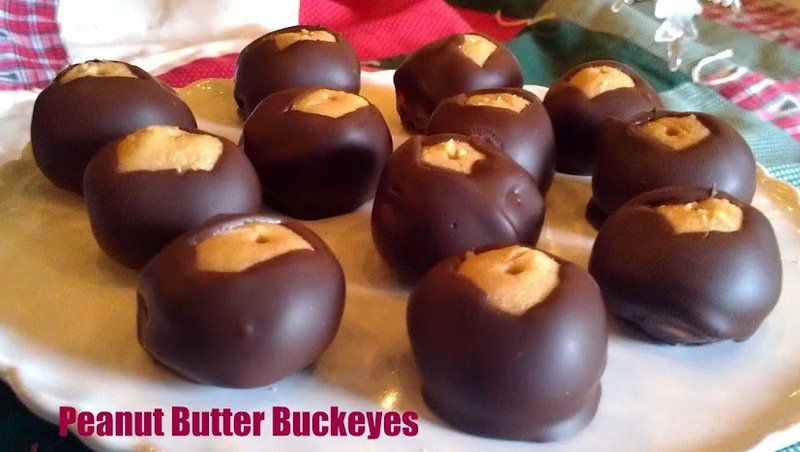 As with years past, this week I made a big batch of buckeyes. They’re not that time consuming and they are always one of the most-commented on goody that I include in the holiday sweet samplers that I make for our friends and extended family each year. Line a baking sheet with waxed paper or parchment paper (or a Silpat mat – maybe Santa will bring me one this year!) and set aside. In a medium bowl combine peanut butter, butter, vanilla, and two cups of confectioner’s sugar with your hands until a smooth, stiff dough forms. Add additional confectioner’s sugar, up to three total cups, if needed to form desired consistency. Roll into a ball using 2 tsp. of dough per ball. Place each on the lined baking sheet; use a toothpick to create a small hole in the top of each peanut butter ball. Place in the freezer for 30-45 minutes, until well-chilled. Remove chilled peanut butter balls from freezer. Dip each one into the melted chocolate leaving just a small bare circle around the hole in the top. Repeat until all peanut butter balls are dipped, then place in the refrigerator for at least 30 minutes to set. Bubbles likes to help me in the kitchen so I gave her a small bowl with a tablespoon or two of peanut butter in it to “mix”. After about 20 seconds of “mix mama! See, mix!” she forgot about the joys of mixing and instead decided to lick it all off the spoon. At least she had fun and is learning a love of cooking! Our whole family always devours these, thanks for sharing your recipe. Our favorite treat though is probably iced sugar cookies! I made these today for Christmas day treats…..ohhh so good!! Thank you for sharing it!! These look so delicious! I should make them for my husband – he loves peanut butter! These are low-calorie and fat-free, right? They look so good. I know they’d be a huge hit in our family. We all love peanut butter and chocolate. Thanks for sharing! I should not be looking at this when I’m hungry…look so good! They are seriously so addictive! I gave most of them away in our Christmas foodie boxes; I knew I would be too tempted! Oh these look divine. I absolutely adore peanut butter and when you add my favorite milk chocolate I’m in heaven. Adding this one to my recipe file. Thanks! Boy I wish I had this recipe before visiting my brother over Christmas. We both love chocolate and PB but don’t care too much for what we find in stores. This looks great! The recipe does not say how many it will make, unless I didn’t see it. Hi Cathy! Refrigerator will help keep them longer, but they’ll also stay on the counter in an air-tight container for a couple of days. And yes, you should be able to freeze them, no problem!